Discovery was our unanimous favorite. We also all agreed that Green’s Beer is indeed some of the best GF beer in the world, and that it can hold its own against “real” beers anytime. In fact, my next experiment will be to hold a blind taste test – I’m going to put Green’s Discovery up against three other regular craft brews, and see if regular beer drinkers can successfully identify the GF beer from a blind lineup. I’m guessing some will get it wrong, but the results will speak for themselves. Stay tuned! 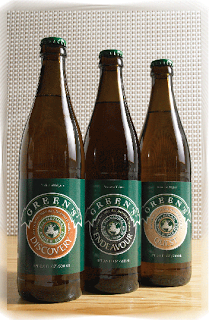 In the meantime, if you’re interested in trying Green’s yourself, Merchant du Vin widely distributes the beers. Check their website for specific locations. Here in Boulder, Colorado, I can buy Green’s at Liquor Mart for about $6.50 per bottle. It’s pricey, but it’s worth it! Wholes Foods is starting to carry this beer as well. I bought 2 bottles to try. Looking forward to it now. Glad to hear that Whole Foods is carrying the beer! The more widely available it is, the better! Greens Beer no longer listed in LiquorMart online catalog. Perhaps revise your blog if this is true. Thanks for the FYI, Anonymous. I’ll update the post accordingly. I’ve been drinking Green’s for a while. It’s my favorite Gluten free beer by a long shot. Green’s is by far the best GF beer I have had. SuperStar Beverage in Bayport, LI, NY carries it. I had to start watching my carb intake, so I thought I’d try a GF beer. I wasn’t very excited about the prospect of drinking anything other than “real beer”. Much to my surprise Green’s had a great taste and as an added bonus,only 6.5 carbs per 8 ounces or half the pint size bottle! I checked the carb content of other GF beers and the carb count was much higher.. I’ll not only recomend “Greens”, I’ll purchase just for the sheer taste.